The sun sets over the west side of New York City, known as Manhattanhenge, a term coined by an astrophysicist and inspired by Stonehenge. The phenomenon where the sun is perfectly aligned with the city's east-west grid on 57th Street only happens twice a year. It is dubbed "Manhattanhenge" and happens two times a year when the Sun aligns at dusk with streets in a glowing magic trick as rays of sunlight span across New York perfectly, from west to east. 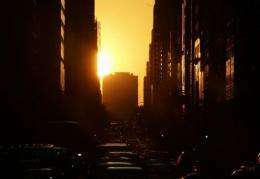 "Manhattanhenge may just be a unique urban phenomenon in the world," says astrophysicist Neil deGrasse Tyson, of the American Museum of Natural History, who officially discovered the phenomenon. The name "Manhattanhenge" is a play on Manhattan, this city's most famous borough, and Stonehenge, the megalithic monument in southern England with large stone blocks set out in concentric circles. At Stonehenge, the Sun crosses the site's central axis during the summer and winter solstices, leading experts to speculate that the site could have been used as a sort of sun calendar, as well as for religious ceremonies. But in Manhattan, the phenomenon takes place before and after the solstices when at dusk but before sunset, the Sun neatly matches up with the even-numbered streets running west and east, sending out fingers of light. "As a kid I visited Stonehenge in the Salisbury Plain of England and did research on other stone monuments across the British Isles," DeGrasse Tyson told AFP. And New York's phenomenon is more unusual than it may seem, he says. "Any city crossed by a rectangular grid can identify days where the setting Sun aligns with their streets. But a closer look at such cities around the world shows them to be less than ideal for this purpose," he stressed. DeGrasse Tyson first started thinking about the "Manhattanhenge" effect back in 1996. It was not until five years later, July 2001, that he took a photo of the Sun-meets-skyscrapers display. It and others were published in 2002 in a special edition of Natural History Magazine called "City of Stars," he said. And the effect began to become better known. This year, the effect took place May 30 -- before the June 21 solstice -- and now it will be seen again on Wednesday July 13, though it can be seen partially one day earlier. In wintertime, the phenomenon is seen around December 5 and January 8. But weather conditions tend not to be ideal, and make it hard for anyone to spot. To get a good take on the event, DeGrasse Tyson recommends that you "position yourself as far east in Manhattan as possible." Some of the streets where the show shines best are 14th, 23rd, 34th and 42nd, offering incredible views of the Empire State building and the Chrysler building. The American Museum of Natural History is offering on Tuesday a special program at the Hayden Planetarium with a visual tour of "Manhattanhenge." Probing Question: How and why was Stonehenge built? The wit and wisdom of Neil DeGrasse Tyson is here brilliantly displayed. Also, the article's author's. Who would have ever parsed "Manhattanhenge" to have been a play upon Manhattan and Stonehenge? I stand in awe. What woul they say about the sun ray that passes the window and strike the center of my house's toilet seat at exactly 9am every solstice? Relic of religious and astronomical monumental arrangements, of course!